Below blog will describe how to change objects from one package to other package with the help of tcode MASS in simple way in any SAP net weaver systems. I have some datasources under package ZSAL in TR and I want to move datasources from package “ZSAL” to other package “ZBW”. Sub TR – ***900087, Datasources collected under package ZSAL. Go to SE03 — Object Directory — Change Object Directory entries of objects in a request, Provide TR and execute. 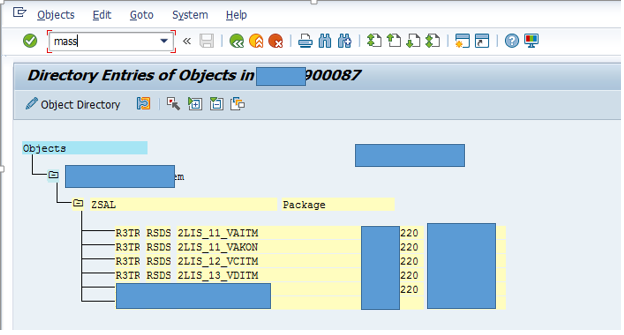 Select Package and press F6( To select all objects under TR in single click). Type t-code MASS as shown below. Below screen will appear. 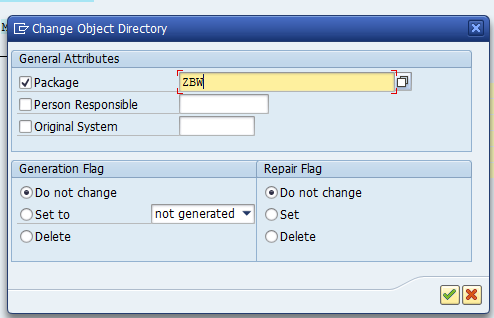 select Package and provide target package name ( here it is “ZBW”) and press enter. All objects moved from package “ZSAL” to “ZBW”.